At 8pm in the heart of Dhaka’s industrial zone of Tejgaon, hundreds of young women file out of a garment factory onto the dark and dusty streets. The scene is repeated in every urban centre throughout Bangladesh, and recurs on the hour as the nightshift workers clock off. Such a sight would have been unthinkable as little as five years ago, and it is still considered unsafe – if not unsavoury – for middle-class women to roam unaccompanied after dusk. But the three million “garment girls” are altering the face of Bangladeshi society and last year accounted for 80% of the nation’s export earnings – yet they remain among the country’s most vulnerable and exploited people. When the Bangladesh government rejected the workers’ demands for a minimum monthly salary of 5000 taka (about £46), instead setting it at 3000 taka (about £27), riots involving 10,000 workers erupted. The Bangladesh Garment and Manufacturers and Exporters Association responded by filing charges against four union leaders for fomenting worker violence. After spending a month in prison, three were released on bail shortly before Ramadan. One, Montu Ghosh, a legal adviser to the Centre for Garment Labour Trade Union, remains imprisoned. Nazma Akter was 11 when she started working in a garment factory and she earned the equivalent of just £2.30 per month. She left after seven years. Today she is president of the Joint Garment Workers’ Federation and general secretary of the Awaj Foundation, which provides legal aid and conducts rights-based awareness campaigns. Akter represented the garment workers in the latest wage commission negotiations. She also worked on the previous negotiation round in 2006, when the minimum wage was fixed at just over £15. She said: “We accepted the new minimum salary because it is almost double the amount of the previous one. We will make fresh demands for higher wages in a year’s time, but now we are fighting for implementation.” Like many other workers, she is concerned that factory owners won’t abide by the law. The government is coming under increasing pressure to better regulate the sector. 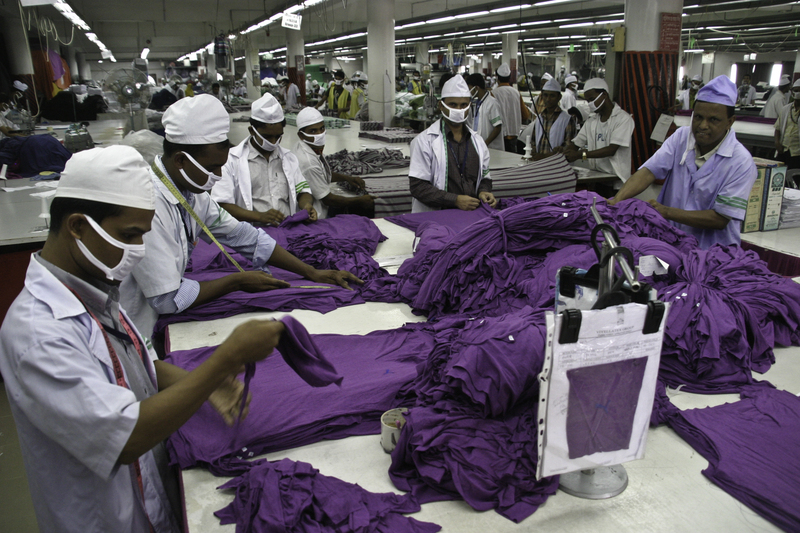 The ready-made garment (RMG) sector emerged in Bangladesh in the late 1960s and currently employs three and a half million people, 85% of them female. David Hasanat is chief executive and chairman of Viyellatex, a Bangladesh garment company which supplies clothes to Marks & Spencer, Debenhams, Esprit and Puma. He said the RMG sector in Bangladesh has “huge potential” to develop over the next decade. “But it requires fine-tuning,” he added – an understatement. About 80% of Viyellatex’s 8000 employees are already receiving wages in line with the new minimum salary, which comes into effect this November. As well as distributing 5% of the company’s profits amongst employees, Viyellatex pays each of its workers 20% more than the legal minimum wage, making it something of a model employer. In 2008-09 the company’s turnover was US$165 million, but Hasanat said it would have been “impossible” for it to raise wages to meet the demands of workers. Tumpa, 18, who works in one of Tejgaon’s 300 factories, disagrees. She quit her job at a factory last February after a “helper”, a young boy, died of jaundice. He was refused sick leave – which in any event takes three days to process – and he died on the job. Tumpa complained that the factory in Tejgaon she now works in has similarly bad conditions. She said: “Our boss misbehaves – he curses us if anything is misplaced or missing. If we don’t finish our work on time, he starts yelling. Sometimes the bosses beat the men, as well as the weakest women.” She had no qualms about taking part in the protests. Hasanat acknowledges that exploitation is rife in many garment factories but he is confident that his own factory, located 20 miles north of Dhaka in Gazipur, is one of the best in the nation – if not the very best. On the day the Sunday Herald visited, a workplace safety workshop was being conducted in a spacious, well-lit meeting room. A large plaque containing the Labour Law Act 2006 is nailed to a wall, as are pictorial instructions on fire-fighting and an anonymous complaints box. The workers wear identical white aprons and their mouths are covered by surgical masks. 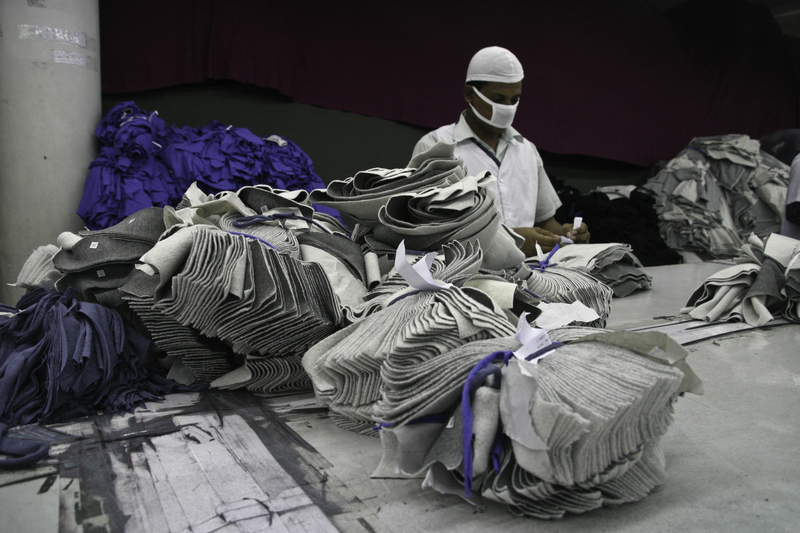 In the samples room, a dozen or so pairs of eyes stare from behind a pile of purple fabric. Some workers do not look up, but remain crouched intently over sewing machines, or make dextrous use of large pairs of scissors. The finished products are familiar – on the far wall are glass lockers containing folded T-shirts, each with a logo stuck to the front of the cabinet: G-Star, Debenhams, Marks & Spencer – it really is just a label. The scale of the operations is overwhelming under the harsh fluorescent light, yet the floor is devoid of human voices. As Hasanat pointed out various labour industry awards in a cabinet, he said: “We provide many facilities, not just the legal ones.” Viyellatex employees receive free lunches, and the leftovers are turned into fertiliser and distributed among farmers in a neighbouring district. Last year, it signed up to the United Nations Global Compact, and the company is offsetting its carbon emissions by planting six million trees in the northern region of Sylhet. In fact, the UN was so impressed with Viyellatex’s efforts to support a “green economy” that Hasanat was invited to make an address on the subject at the UN’s Private Sector Forum as part of the summit on Millennium Development Goals in New York last weekend. Hasanat used the opportunity to bemoan the fact that his government provides no incentives for Bangladeshi companies to adopt eco-friendly practices. And along with complying with the 112 days stipulated for maternity leave, Viyellatex also provides free medical assistance at work, an antenatal clinic and childcare facilities. Such initiatives are in stark contrast with the situation Nadiya, 21, faces. She pointed to her swollen belly as she stood on the street in Tejgaon and said she is certain she’ll be sacked from the factory she works in when she gives birth. He also complained that few people are aware that Bangladesh is the world’s second largest clothing producer and that it is consequently “globally underrated”. He said: “After China, we are the only country with the capability. Cambodia is small and cannot compete with us and Indonesia is not so competitive.” He believes that if it were mandatory for a “made in” label to be used when supplying to EU countries, Bangladesh would have the standing it deserves. He formerly supplied garments to a high-end Italian brand. During a visit to Hong Kong, he recognised his products selling at a very high price. “The label said that the clothes were made in Italy,” he noted dryly. Hasanat acknowledges that buyers have been concerned by the unrest, but emphasised that only 5% – about 100,000 workers – took part. He appears confident that the sector will continue to flourish, and many certainly hope that other factories will follow in his business model’s footsteps. The small factories in the north part of Dhaka are more horrible. Whenever buyers or any important persons are visiting the factory, first thing they do is hide all the under age workers behind the factory or in a small room! they say that underage workers are useful for small works, but actually they work full time with too low income! That’s really interesting, and terrible to hear. I wanted to write about the colourful dresses of the garment girls – i’m glad you shared that but i wish i had done so myself!